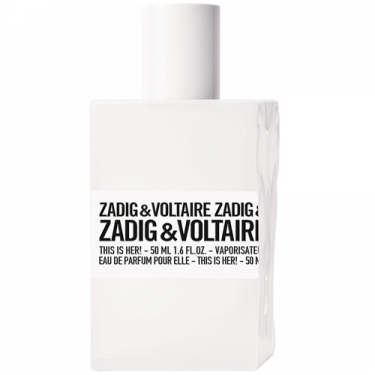 DESCRIPTION: This is Her EDP from Zadig & Voltaire is a feminine woody scent. This fragrance is the epitome of Parisian youth. Her floral signature tells the tale of a free woman with a rebellious spirit. Its soft notes represent love, and its woody notes signaling incalculable seduction. This is Her Shower Gel is a shower gel designed to perfectly complement the scent. This shower gel wraps the body in luxuriously scented bubbles. After use, the skin becomes fresh, smooth and sublimely perfumed. This is Her Body Lotion is a body lotion that caresses the skin, sliding over the limbs with a sensual touch. After use, the skin becomes soft, smooth and sublimely scented. FRAGRANCE: Pink pepper, sambac jasmine, chestnut cream, vanilla and sandalwood.